Chang Jiang 750 transmissions often slip gears so this is quite a common problem that can easily be corrected, however it does require some playing around. Below I have recommendations on maintenance from Jim Bryant (www.mycj750.com or jim@way2prc.com) and also from Bill. Big Bill's Bikes is on MSN almost 24/7 at: cj750net@hotmail.com For those that are do not have a hotmail address, you can sign up to MSN Passport and use your mail address to chat on MSN Messenger. Do note that the gear adjustment pins are very sensitive so no rotation should be more than a 1/4 turn either way. In most cases try different adjustments till it is shifting properly. Many CJ750 sidecars have a problem with the transmission jumping out of gear. The most common cause of this is a misadjusted foot shifter. If the problem is with 1st or 2dn gear, adjust slightly the lower adjusting screw and tighten the lock nut. Be sure not to adjust more than ¼ turn. Then tighten it and test ride the bike. If it’s in the higher gears, then adjust the upper adjusting screw and again tighten the lock nut. You will have to ride the sidecar and try out the adjustments each time to see if it is properly adjusted. This adjustment is normally set by the factory and they advise against moving either screw. When shifting gears the gear shift handle on the right side should travel equal distance between each shift. If the gears are slipping you will notice that the gear shift handle will have more movement or in some cases not even move when you are shifting gears with the pedal. It is recommended that you prop your CJ750 up so the back wheel is off the ground and shift gears and run the engine to see if the it is over shifting or under shifting. Make sure the bolt is tighten after adjustment. Be careful of shops that just want to replace everything before making any adjustments to correct your gear slipping. Play around with the adjustments and you will be able to feel the difference in the shifting. 1) When in high gear going to low gear, the gear shift rod does not move or has very little movement; Loosen top screw (A) by a 1/4 turn counter clockwise. 2) When in high gear going to low gear, and the shift rod will move more then its normal position, the gear goes to neutral; Tighten top screw (A) by a 1/4 clockwise turn. 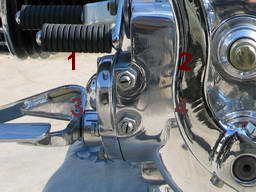 3) When going from low gear to high gear, the shift rod does not move and the transmission goes into neutral; Loosen top screw (B) by a 1/4 turn counter clockwise. 4) When going from low gear to high gear, the shift rod goes more than the normal position; Tighten top screw (B) by a 1/4 clockwise turn.